Madeline joins the riders on the Flying Horse Carousel in Watch Hill. There are a handful of things that Rhode Island can claim to be the “oldest in America” — such as the oldest synagogue and the oldest lending library. Apparently, we also have the oldest carousel. The Flying Horse Carousel in Watch Hill originated in 1876 and is named for the fact that its 20 horses are not attached to the floor but remain suspended from a center frame, swinging out or “flying” when in motion. There is an age limit — no one over 12-years-old may ride, and I particularly liked the sign recommending you re-consider if you are over 100 lbs or over 5 feet tall. Rides are $1 for an inside horse and $1.50 for an outside horse. 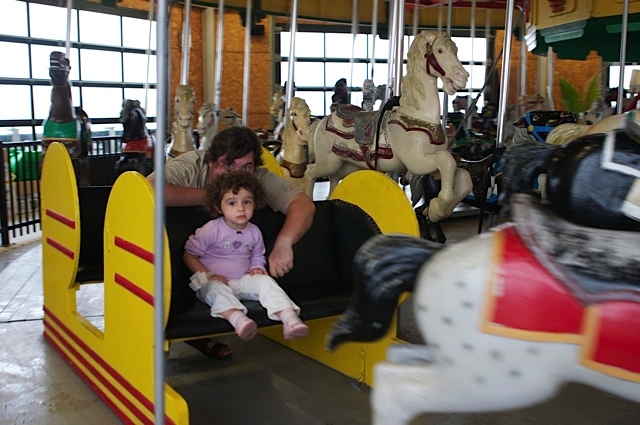 The Easton's Beach carousel makes for a great rainy day activity. 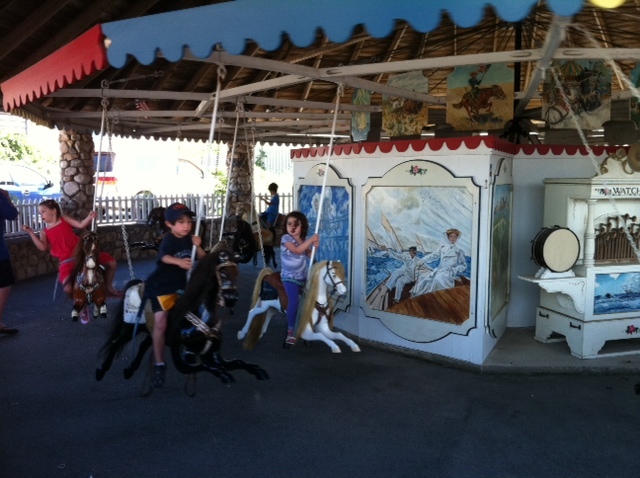 For more information on Rhode Island carousels, see http://sos.ri.gov/kidszone/carousels/ or KidoInfo’s list.